Get Answers How can I PLAY with my baby today? What GEAR / TOYS are best for my baby? Is my baby on track with MILESTONES? What can I do about a FLAT SPOT on my baby's head? Am I doing TUMMY TIME correctly? How do I feed my baby SOLID FOODS? How can I help my baby SLEEP better? What is INTENTIONAL PARENTING? How can I PLAY with my baby today? What GEAR / TOYS are best for my baby? Is my baby on track with MILESTONES? What can I do about a FLAT SPOT on my baby's head? Am I doing TUMMY TIME correctly? How do I feed my baby SOLID FOODS? How can I help my baby SLEEP better? During the second half of your baby’s first year, he’s supposed to develop what’s called a pincer grasp to pick up tiny objects. (Some people call it “pincher” but Occupational Therapists like me stick with the super-nerdy technical variation). But how in the world can you help your little one practice grasping tiny objects when every.single.thing goes in the mouth??? This page includes affiliate links, which means I earn a small commission when you purchase products through these links. I only link to products I use or love. Thanks for supporting CanDo Kiddo. See my disclosure page for more information. -a wooden inset puzzle (that means the pieces drop down into their spots); one with small pegs is fine because as baby's grasping skills develop you'll be able to ditch the ribbons and use those little pegs! *if this is your first baby, you may not have a puzzle like this yet but trust me, it will be played with for a long time to come in the toddler years so it’s a smart purchase now. My favorite source for wooden puzzles is Amazon (because I don't have to leave my home with three small children or wear real clothing) where I always search directly for Melissa and Doug puzzles. You’ll flip puzzle pieces over and tape a strip of ribbon or yarn a little bit wider than the piece onto the back. You can do all the pieces or just a few - your choice! Then place the pieces in the wooden puzzle frame and present it to your baby. Early baby grasps use the whole hand, especially the pinky and ring fingers, and press the object into the palm. This works well if your mission is to grab and pull mommy’s hair or grab a rattle to put in your mouth. But as baby’s daily play starts to get more advanced - putting objects in containers, putting objects together to bang or picking up “just right bites” of solid food (small bites safe for early eaters) - he’s going to need more accurate and skilled ways of grabbing. Watch for your baby to visually zero in on those little snippets of ribbon and use some fumbling trial and error until they find a grasp that works. And as always - happy playing with your kiddo! 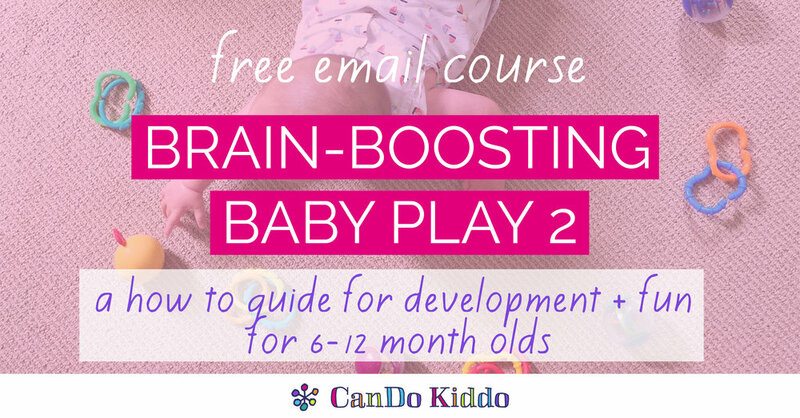 Want an Easy Guide To Developmental Baby Play? Struggling to know what to do with your baby to promote healthy development now that your little one isn't just a floppy newborn anymore? Here's your expert guide - featuring 40 simple ways to play with your bigger baby plus how they can make your little one smarter and stronger. "Worth every penny to have developmentally-appropriate activities explained by a professional to help your baby develop their motor skills." "Excellent enriching activities all new parents should know." Supporting new and expectant parents, demystifying infant development and inspiring creative play for healthier babies. Written by a pediatric Occupational Therapist. I'm a pediatric Occupational Therapist helping fellow parents understand baby development so that you can confidently and playfully give your kiddo the healthiest start possible. All CanDo Kiddo activities assume close supervision of your baby. Read full disclaimer.